As its name suggests, allspice's flavor is reminiscent of a combination of spices, including cloves, cinnamon, nutmeg, and pepper. It is used for baking, pickles and sausage making. The allspice tree, a member of the myrtle family, is indigenous to the West Indies and Central and South America. Jamaica produces most of the world's allspice supply, and not surprisingly, allspice figures strongly into Jamaican cuisine. 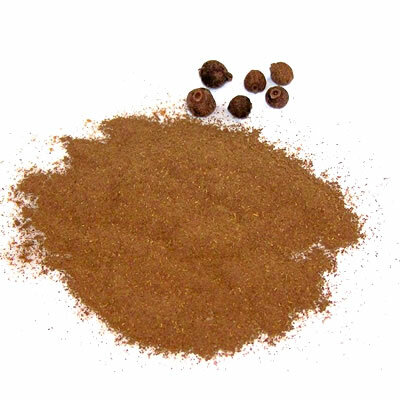 The complex, exotic flavor of Jamaican jerk chicken and jerk pork can be attributed primarily to allspice.